Afternoon tea is a tradition inspired from England and is a nice way to relax and enjoy some of the Washington DC area's most unique historic venues. Make a reservation for afternoon tea at a tea room or tea specialty store in Washington, DC, Maryland and Virginia. Please note that hours are subject to change. Please call ahead to confirm. Ching Ching Cha - Tea Room - 1063 Wisconsin Avenue NW Washington, DC (202) 333-8288. Located in the heart of Georgetown, this Chinese tea house serves tea and light fare. Henley Park Hotel – Afternoon Tea - 926 Massachusetts Avenue NW Washington, DC (202) 638-5200. Afternoon tea served daily, 4 to 6 p.m. A la carte menu. Reservations required. Hillwood Café at Hillwood Museum – Tea Room and Afternoon Tea - 4155 Linnean Avenue NW Washington, DC (202) 243-3920. Full service dining is available in the cafe Tuesday through Saturday 11 a.m. to 3:30 p.m. Sunday afternoons, choose from a selection of teas, finger sandwiches, and miniature pastries. The museum is closed the month of January and all holidays. Reservations required; parties of four or less may reserve the same day; parties of five or more require 24-hour advance reservation. Private parties include a tour of the estate and gardens. Lady Camellia - Tea Room - 3261 Prospect Street NW, Washington, DC 20007 (202) 333-2308. 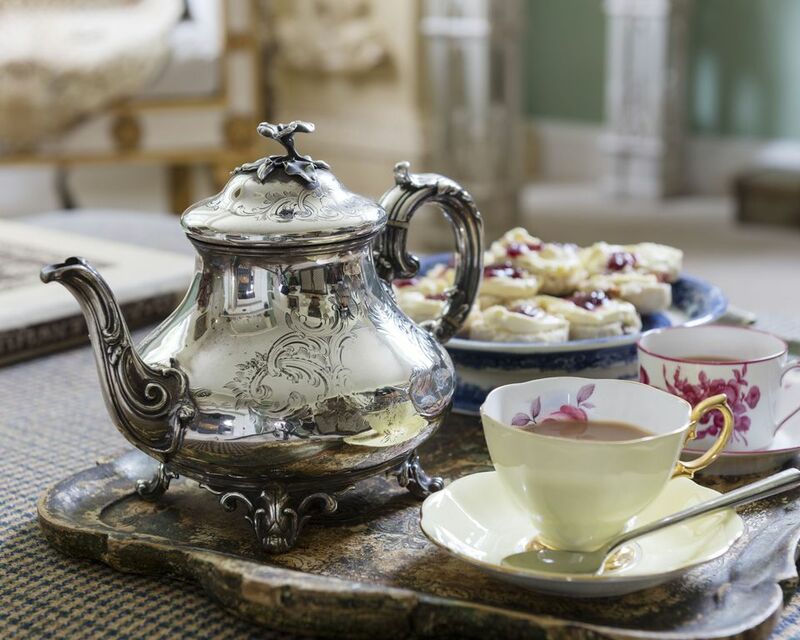 Enjoy an afternoon tea service with cream teas and tea sandwiches in flavors like smoked salmon or brie and apple. Children's tea parties are available too. Teaism Tea Specialty Stores - Three locations: 2009 R Street NW, Washington, DC (202) 667-3827. 800 Connecticut Avenue NW, Washington, DC (202) 835-2233. 400 8th Street NW, Washington, DC (202) 638-6010. These locally owned teahouses/restaurants offer a wide selection of tea, Japanese bento boxes, tandoori kebabs and Asian inspired sandwiches. Tea Cellar at the Park Hyatt Washington – Tea Room - 24th and M St., NW. Washington, DC (202) 419-6755. Tea Cellar features rare and limited production, single-estate teas from remote regions of China, Japan, Sri Lanka and the Himalayas. Washington National Cathedral – Afternoon Tea - Massachusetts and Wisconsin Avenues NW Washington, DC (202) 537-8993. The National Cathedral Tour and Tea Program is held Tuesdays and Wednesdays at 1:30 p.m. A guided tour highlights the cathedral’s art, architecture and history. Afterwards, enjoy tea and scones in the beautiful St. Paul Room overlooking panoramic views of Washington, DC. Reservations are required. Willard Intercontinental Hotel – Afternoon Tea in the Peacock Room - 1401 Pennsylvania Avenue, NW Washington, DC (202) 637-7440. The Willard is an historic landmark located in the heart of Washington near the White House offering Afternoon tea, Royal tea, and dessert tea. Reservations are accepted. Strathmore Mansion – Afternoon Tea - 10701 Rockville Pike North Bethesda, Maryland (301) 581-5108. Afternoon Tea is served by volunteers on Tuesdays and Wednesdays at 1 p.m. Volunteer musicians perform. 7418 Baltimore Ave. College Park, Maryland (301) 864-8920. This tea specialist is the largest and best known tea manufacturer in the Far East. Tea can be purchased online or at these two local locations. Normandie Farm Inn - Afternoon Tea - 10710 Falls Road, Potomac, Maryland (301) 983-8838. Afternoon Tea at 2:30 or 3:00 p.m. on the first and third Wednesday of every month. Reservations are recommended. Tea is buffet style and features tea, tea sandwiches and desserts. Live entertainment. The Ritz-Carlton Hotel – Tyson’s Corner – Afternoon Tea - 1700 Tysons Boulevard, McLean, Virginia (703) 506-4300. Tea Room offers tea from 12 to 4 p.m., Friday through Sunday. Royal tea available with a glass of champagne as well. Reservations required 24 hours in advance. Crest Hill Antiques & Tea Room – Tea Room and Store. 4303 Fauquier Avenue, The Plains, Virginia (540) 253-5790. The English style tea room, located in Virginia Hunt Country, offers more than 2 dozen loose-leaf teas, scones and other home-made pastries, sandwiches, salads, fruit and cheese plates, and other typical tea room fare. The Tea Room is open Wednesday through Sundays, from 11 a.m. - 4 p.m. The Plains is a charming little village with restaurants, art galleries and other attractions.